If you watched and listened to Dr. Oz and Dr. Mercola, they only talk about the essential amino acid L-Arginine. Technically they are correct from the standpoint of your endothelial cells using L-Arginine to create nitric oxide. Because nitric oxide relaxes the smooth muscle of the vascular wall to help maintain proper blood pressure, keeps blood platelet cells from sticking together to prevent heart attacks and stroke, and repairs the damage done to the endothelium to prevent atherosclerosis and arteriosclerosis, what Dr. Oz tells us about L-Arginine is critically important. But there are some other ingredients that need to be part of the equation, especially if you want to create nitric oxide in sufficient amounts to be therapeutic to your cardiovascular system. Dr. Oz, L-Arginine, and an Additional Key Ingredient! One of those ingredients needs to be the amino acid L-Citrulline. L-Citrulline recycles L-Arginine to have a synergistic effect on extending the endothelium’s ability to properly produce nitric oxide. Here’s what I mean. What Dr. Oz doesn’t tell you is critically important. If you combine your L-Arginine with a therapeutic level of L-Citrulline then you will increase this window of improved nitric oxide production to a 24 to 36 hour window. That’s huge especially in helping to repair your endothelium so that you can heal your vascular wall for long term improvements in your circulation. This means that you need both of these amino acids in sufficient quantities to truly obtain a benefit. To help you better understand this I’d like to provide two quotes from Dr. Louis J. Ignarro. Dr. Ignarro won the 1998 Nobel Prize in Medicine, along with two other American researchers, for discovering how your endothelium converts the essential amino acid L-Arginine into nitric oxide – the most powerful signaling molecule of your entire cardiovascular system. These quotes are taking from his 2005 bestseller NO More Heart Disease. Dr. Oz Doesn’t Tell You How Much L-Arginine to Use! Does it include L-Citrulline? If it doesn’t, then you are wasting your time and money. Does it include sufficient amounts of both L-Arginine and L-Citrulline to create a synergistic and therapeutic benefit? According to Dr. Ignarro you need 4-6 grams of L-Arginine and 200 to 1000 mg of L-Citrulline to have a therapeutic effect. Anything less and you’re not going to get improved nitric oxide production. According to Dr. Ignarro, “Nitric oxide is the body’s natural cardiovascular wonder drug.” But for you to get a therapeutic effect to aid you in improving the health of your cardiovascular system, then you need to be taking both L-Arginine and L-Citrulline in sufficient quantities. There’s much more that could be said about the creation of nitric oxide; such as the need for Folic Acid and other antioxidants to enhance nitric oxide production over a long period leading to therapeutic benefits. I’ve prepared two videos to help you better understand this. My next post will highlight these two videos. The first video covers which foods will help you obtain L-Arginine, L-Citrulline, and Folic Acid since these three are critically important in helping your endothelium properly produce nitric oxide. The second video will cover whether it is better to get your L-Arginine, L-Citrulline, and Folic Acid through food or supplementation. If you would like to order Dr. Ignarro’s book NO More Heart Disease then please click here! Together we can work to save a million lives by help to education others about what was said by Dr. Oz on L-Arginine but also including the other key nutrients for improved nitric oxide production! The information contained in this article is for general information purposes only and never as a substitute for professional medical advice or medical exam. 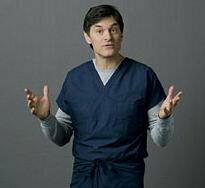 The information about Dr. Oz on L-Arginine has not been evaluated by the Food and Drug Administration and should not be used to diagnose, treat, cure or prevent any disease without the supervision of a qualified medical doctor. This entry was posted in Endothelial Cells, Heart Disease, L-Arginine, Nitric Oxide and tagged Alternative Health, Arteriosclerosis, Atherosclerosis, Cardiovascular Health, Cardiovascular System, Dr Oz, Endothelial Cells, Endothelium, Essential Amino Acid, L Arginine, L-citrulline, Nitric Oxide, Supplementation, Synergistic Effect, Vascular System, Vascular Wall by Dan Hammer. Bookmark the permalink. I have been using L Arginine, 500 mg capsules for 5 years. I take 5 grams split to AM and PM. At 65 yrs of age, and having had a heart attack 10 years ago, I will assure you that taking this will help lower your blood pressure, improve ones’ libido, and is actually amazing. My wife is a few years younger and will start at 4 grams split into AM and PM soon. I am a believer. Never have I had side effects, only positive results.